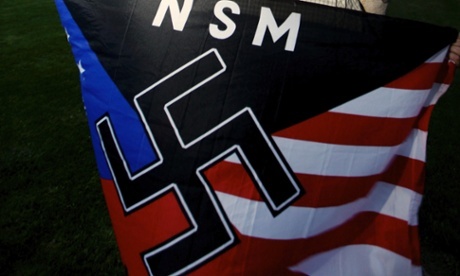 Jeff Schoep, commander of the American National Socialist Movement (NSM), is preparing to travel from Detroit to Leith to hold a town-hall meeting and press conference on Sunday afternoon. On the NSM website, he describes the trip as a “gesture of goodwill”, but goes on to say ominously that the aim is to “plant the seeds of National Socialism in North Dakota”. Anti-racist activists are also expected to descend on Leith from other parts of North Dakota and neighbouring Minnesota. “We cannot accept this racist hatred they are bringing here – Leith is in crisis and is crying out for help,” one of the organisers, Jeremy Kelly, told the Bismarck Tribune. Leith’s conundrum began when a newcomer called Paul Craig Cobb began buying up deserted plots of land two years ago, accumulating 12 plots in total. Last month it was revealed by the Southern Poverty Law Center, which monitors right-wing extremism, that Cobb, 61, is in fact a white supremacist wanted in Canada for promoting hatred in a blog. Heidi Beirich of the Southern Poverty Law Center said Cobb’s attempt to form an extremist community was in line with previous efforts to set up such collectives in Idaho and Montana. “Cobb has probably gone further than anyone before him in pursuing this white supremacist dream,” she said. The publicity surrounding Cobb’s plans in Leith is likely to put a stop to his acquisition of any further land in the area, as local property owners are now wary of dealing with him. But there is little that can be done, Beirich said, to force him to give up the plots he already owns. Leith residents are trying a variety of different moves to encourage him to leave town and have created a defence fund to pay for legal fees. One potential tactic is to have his house condemned under local amenity laws – Cobb’s property is not linked up to water or sewer services. A more extreme move that is being discussed would be to abandon Leith’s status as a town before neo-Nazi supporters get close to outnumbering the other residents and thus controlling the town hall.